When Duchene returns to the fold – likely after the Christmas holidays – the clock will be ticking to get him signed to a new contract. With the trade deadline set for Feb. 25, it would give Dorion less than two months to either sign Duchene to a contract extension or move him to another team. After giving up so much to acquire him in the first place, there’s no chance the Senators could let Duchene walk out the door with nothing in return. The feeling around here is Duchene is signed to a contract extension by the deadline or he’s gone. It’s worth noting that in the salary cap era – since 2005-2006 – the Senators have never waited this long into a season to sign a player to a long-term contract extension. They’ve actually never signed a player to a five-year extension in the period between Dec.1 and the trade deadline of any season. In their franchise history, the Sens have signed a total of seven different players to a contract that lasted five years or more. Only once – with Jason Spezza signing a seven-year deal on Nov. 2, 2007 – did the negotiations bleed into the regular season. It should be noted that Spezza was set to become a restricted free agent at the end of that season, so the dynamics were a little bit different than what we’re seeing with Duchene – who could potentially walk out the door for nothing this summer. That’s not to say the Sens haven’t flirted with late deals when signing potential unrestricted free agents. In 2015, Marc Methot agreed to a four-year contract extension worth $4.9 million per season on Feb.16 – just two weeks before the trade deadline. In 2017, the team agreed to a four-year deal worth $3.25 million per season with Zack Smith on Jan. 23 – about six weeks before the trade deadline. But considering Duchene is likely looking for a contract in the neighbourhood of eight years, it would seem somewhat flawed to use Methot and Smith as legitimate comparables. Instead, we should look at players who have re-signed with their teams on eight-year contracts with cap hits in the neighbourhood of what Duchene will cost. Looking at that breakdown, you’ll see that approximately 90 per cent of these eight-year deals were signed in the period between June and September. That leaves four maximum extensions that were signed at some point after the calendar flipped to October to start the regular season. The two players who signed in the month of October in the past five years – Buffalo’s Jack Eichel and Florida’s Michael Matheson – were both pending restricted free agents. The only player to sign an eight-year contract extension in the month of November was San Jose defenceman Brent Burns, who hammered out his extension with the Sharks on Nov. 22, 2016. In the past five years, the only pending UFA to re-sign with his team for a maximum eight-year contract in the period between Dec. 1 and the NHL trade deadline was Kings captain Anze Kopitar, who inked an eight-year deal worth $80 million on January 16, 2016. While the dollars might be on the high side, Kopitar is probably the only true comparable for Duchene in the past few seasons – an elite centreman and pending UFA, with a contract negotiation that went into the month of January before he signed on the dotted line. In most cases, these deals are hammered out in the summer time. 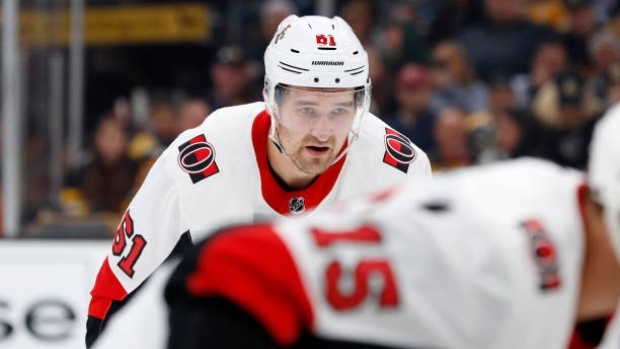 In Dorion’s defence, he was entangled in the Erik Karlsson situation this past summer and the unknown status on that front may have muddied the waters on trying to get a long-term deal done with Duchene’s camp. It may have also affected his ability to get a deal done with Mark Stone, which is why the two sides agreed to a one-year deal this summer. Dorion can officially sign Stone to a contract extension at some point after Jan.1 – which is now less than a month away. The Senators insist they were close to hammering out a long-term extension with Stone this past summer. But most experts believe Stone’s contract will look similar to Duchene’s in terms of dollar and term and that could make it tricky for the Senators. The challenge for Dorion is clear: Try and sign two star players to eight-year contract extensions between now and the trade deadline. But to put it simply, we’ve reached a window where it’s virtually unheard of to sign a player to an eight-year contract. That’s not to say it’s impossible – just that recent history suggests it is highly unusual.